This is an easy recipe for tender, juicy pork with fresh flavors of citrus and garlic. If you’re the sort to keep a jar of your own homemade sofrito handy in the fridge at all times, feel free to substitute that for the cilantro, pepper, and onion. 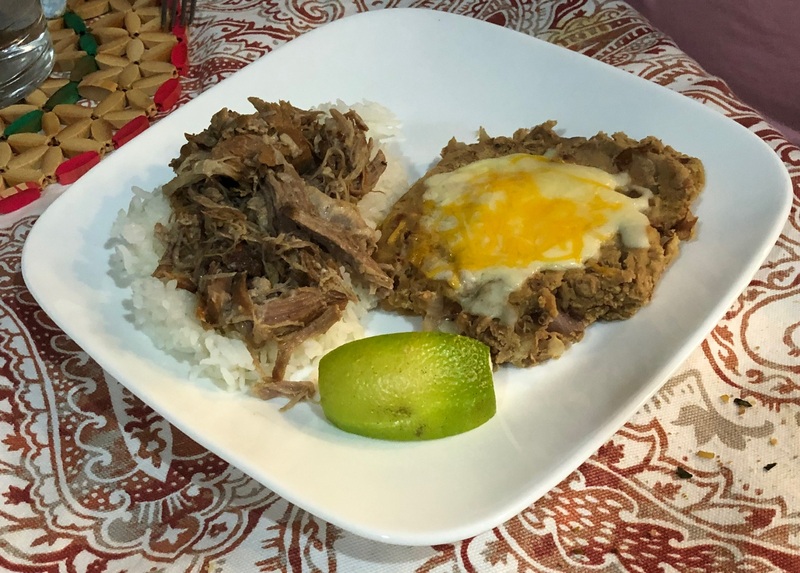 Shredded pork over rice with a side of refried beans (also made possible by the instant pot!). In a 6- to 8-quart instant pot (or pressure cooker of your choice! ), set to sauté and heat the oil. *If you like searing your meat before pressure cooking, feel free to do it now. It isn’t strictly necessary, but if you decide to do it, be sure to pat the pork shoulder dry before browning on all sides and removing from the instant pot. Add the cilantro, pepper, and onion, and cook until soft and fragrant, about 1-2 minutes. Turn off the sauté function, and add the pork shoulder, along with the rest of the ingredients. Close the instant pot and set to cook for 50 minutes at high pressure. Once the cooking time has completed, turn off and quick-release the pressure, then remove the lid. Let the pork shoulder rest in its cooking liquid for 10-15 minutes before skimming any fat from the surface. Shred the pork either on a cutting board or–as I prefer it–in the instant pot. Serve over rice with your favorite bean or veggie sides while it’s still hot, and try it out in tacos or burritos if you have leftovers. Don’t forget a little squeeze of lime before digging in.